Adam was a youthful starter in property management working for Town & Country Lettings in England where from the age of 20 he was conducting viewings and undertaking their routine property inspections. He was influenced by family to make property management his career and it gave him a good understanding of the housing market and the rules and regulations which govern it. He particularly enjoyed his dealings with tenants which gave him an early appreciation for the importance of relationship building. When Adam moved to New Zealand his desire to continue working in this industry led him to Eves Property Management where in a short time he had built his portfolio to nearly 150 properties. His background in the industry meant he quickly understood the way property management is handled in New Zealand and particularly by Eves, skills he has applied successfully in Hamilton. 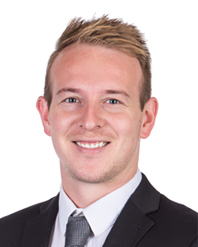 Adam finds Eves' close relationship with Bayleys Real Estate and with Rothbury Insurance brokers enhances his ability to add properties to his portfolio and rounds out his market knowledge. He also keeps a close eye on other rental websites as a comparative exercise. Adam has proven himself very approachable, understanding and hardworking - always endeavoring to provide the best service possible. "Time management is absolutely critical," he comments. "I take pride in my role and aim to stand out for the way I manage my working day and plan and prioritise tasks. This means being flexible as well. If a landlord needs something done urgently that becomes my priority." Adam is still in his 20s and sees his youth and energy as an advantage for his ability to get on with the job with enthusiasm and handle any stressful moments calmly and sensibly. Adam brought his love of the 'beautiful game' with him. "As soon as I jumped off the plane I joined the Cambridge Football Club and play regularly for the men's first and second teams." He trains twice a week and enjoys the social side as well; as energetic and outgoing in his sporting life as he is in his professional one. I would like to thank you for all you have done, your expert knowledge, your approachable professional manner and your quick and patient replies to my concerns. I will thoroughly recommend you to anybody looking for property management services. I will most definitely be using your services again in the future. We like to express our gratitude and appreciation to Adam for managing our properties since February 2016. We are extremely happy with the way Adam manages our properties and have our best interests at heart without ever compromising the wellbeing of our tenants. Adam is always well organised in managing all maintenance be it, minor and major (modernising a bathroom and etc) very efficiently and always have our interest at heart. If you are looking for a property manager who is honest, reliable and with excellent line of communication then Adam is the man. We have no hesitation at all in recommending Adam to anyone who is looking for a property manager. With Adam looking after your investment property/properties you know you are in good hands. Hi Adam, I am very happy with the service you and your company provide me , all can say is excellence, thank you very much. Very happy since I’ve been with Eves - if they had a problem, they would be sure to tell me. Easy to get hold of and responds promptly to emails and calls looks after the property very well. Our property manager Adam Brady has been very co-operative since we moved in a few months ago. He responds very quickly to any concerns we have and gets them sorted as soon as he can. He has gone out of his way for us to ensure we received some heating in our flat. His attitude is always positive, making it easy and comfortable to approach him about flat concerns. He has been our best property manager and we're hoping to re-sign our flat contract just for him. During the period of our tenancy at 17 Oxford Street, Fairfield, Adam Brady was our property manager. We found his service to be very professional. Adam was very approachable and we felt he was easily contacted and happy to help throughout this time. Any issues we had were very quickly and easily resolved. This is unlike some past experiences we have had. We highly recommend Adam and thank him for all of his assistance. Adam has been our Property Manager with Eves Hamilton since January 2015, for 20 residential rental units which we have owned in Hamilton for more than 10 years. Adam has always been very pleasant, honest and totally reliable. He has been diligent in his reviews of each of the units and has co-ordinated repairs and upgrades to the units where these were required with willingness and enthusiasm. He has been sensitive to the needs of the tenants while acting promptly to deal with problems when they have arisen. We really appreciate Adam's enthusiasm for the job, which we know is demanding; including attention to many and varied details for a large number of tenants and property owners. He has a very professional and calm manner. The Eves Hamilton accounts have been managed very well by Adam and the team in the Office. We highly recommend Adam as a Property Manager.